Debbie Shank, a former Wal-mart employee became totally disabled in an automobile accident. She sued the trucking company that was involved in the crash. She received $470'000.00 as a lawsuit settlement. She lives in a nursing home. She is physically and mentally disabled. Wal-mart could have added a donation to the trust fund as a farewell gesture. What did they do? They sued Mrs Shank to recover the money laid out from the lawsuit settlement. Wal-mart has many opponents who question their role in American communities and their treatment of their employees. Such cruel treatment of a former employee is a descent to a level beneath imagining and beneath the most seething contempt that I can muster. I have shopped at Walmart. It is a tempting environment in which to shop. I am ashamed that the profits made from my decision to shop there have gone to such an evil lawsuit as they have mounted against Debby Shank. I can never walk through Walmart's doors without being haunted by the image of Debby, her husband and family being hounded by this corporate giant with neither heart nor soul. If the courts can find no grounds to bind Walmart to the most basic standards of human decency, then that leaves the shopping public as the last earthly court of judgment . Vote with your wallet. 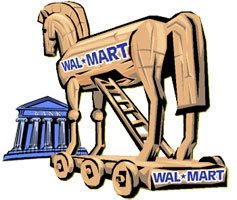 Why shop at Walmart when there are other corporate giants with a far better record of treating their employees? If Target, H and M , Caldors or any other competitor of Walmart wanted to shame Walmart, they could make a donation to Debby Shank's trust fund. I will not be shopping at Walmart any time soon. I hope you will not shop there either.